Last week was part one of my War of the Spark design story. In it, I talked all about how we came up with and executed on the Planeswalker theme of the set. Today, I'm going to talk about one of the two mechanics in the set, the returning one. This is no simple story though because that returning mechanic is proliferate, and its return journey to Standard Magic is a long and winding one. I'm going to tell that story today and then preview a brand-new legendary creature with proliferate that I'm sure many of you will enjoy. I hope that sounds fun. But before I get to that, there's something I wasn't able to get to last week with all my Planeswalker talk—I need to introduce my Vision Design team for War of the Spark. Peter is an outstanding tabletop game designer. 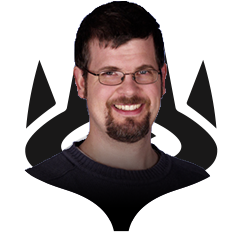 He got his start at Wizards of the Coast working on the Dungeons & Dragons miniatures line. He then went on to work on the roleplaying game. We were lucky to get him for a while working on Magic. This was his first time on a Vision Design team, but he was on the Set Design teams for Dominaria and Ravnica Allegiance. 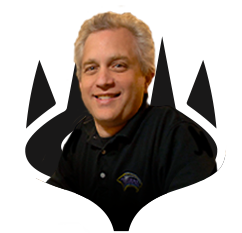 He's probably best known by Magic players as the lead designer of the Explorers of Ixalan board game. Peter was my "strong second" on this set, managing the card file. This set was a bit of baptism by fire for Peter, as he'd never done vision design before, but he was a natural and added a great deal to the set. James was the creative liaison for War of the Spark. As I explained last week, this is what we're referring to as an "event set" in that the driving force behind the design was not realizing a world but rather bringing to life an event. Because of this, the story integration was at a level we'd never done before and it required a lot of work from James. 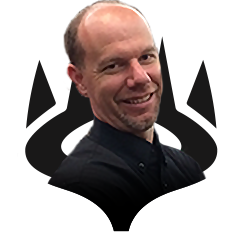 I remember many meetings where we were trying to up the number of planeswalkers in the set and we were going, "James, who else could we have here? Could so and so be here?" James would always make his best guess then go and check with the rest of the Creative team. 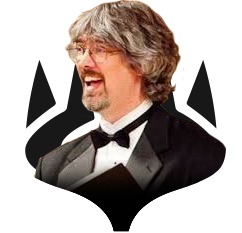 If you enjoy all the creative integration in War of the Spark, James was a big part of helping it all come together (as was Doug Beyer, who was the story architect of the Bolas arc). Dave was the set design lead for War of the Spark, and he always likes being on the Vision Design teams of the sets he leads. (This has become something we now ask of all our set design leads.) Dave likes to have a lot of input into the mechanics during vision design and then tends to keep them throughout set design. All the mechanics in War of the Spark, for example (proliferate, amass, and all the planeswalker variation) were created and/or added in vision design. As the set design lead, Dave's responsible for looking forward and making sure that all the components and tools we're creating in vision design will be able to be properly put together to make a fun, cohesive, and balanced set. I've worked a lot with Dave, and it's always a treat. Ken started the design as my "strong second," but he was needed on another project two months in and had to leave the team. Ken and I have worked together extensively over the years, and it's always a pleasure to have him on a design team. The first few months of War of the Spark design were pretty out there (more on this next week), and Ken was always along for the ride. Jackie swapped in for Ken when he had to leave the team. My favorite thing about working with Jackie is that she has strong opinions that usually stem from a very different vantage point from my other designers. She always brings up things I hadn't thought about and makes me answer questions that might have never been asked otherwise. 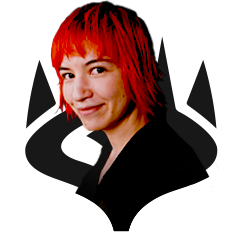 Jackie, in particular, had a lot of strong opinions on planeswalkers that helped us in figuring out how to add so many to the set. With that out of the way, let's talk proliferate. Proliferate started as just a single card. Scars of Mirrodin was reintroducing the Phyrexians after a rather lengthy absence from the game and we were trying hard to weave the feel of Magic's oldest baddies into the gameplay. To do this, I gave the Phyrexians four adjectives and asked my team to design around them. Those adjectives were: adaptive, toxic, relentless, and viral. The overall feel of the Phyrexians was that of a virus. That led us to creating infect, which gave the opponent poison counters and their creatures -1/-1 counters. I then designed a card to interact with the poison and -1/-1 counters. It was called something like "Spread the Disease," and it gave an extra poison counter to any opponent with a poison counter and an extra -1/-1 counter to any of the opponent's creatures with at least one -1/-1 counter. I liked how the card played, so I started making more of them. Eventually, I turned it into a keyword action. Mark Globus liked the mechanic, but wondered why it didn't just affect all counters? Scars of Mirrodin had charge counters, for instance, and he felt it would be fun to affect those. In addition, opening up to all counters would make it backward compatible and allow players to invent crazy things to do with it. I changed it on the spot. Scars of Mirrodin design had a lot of proliferate, much of which got scaled back in development. The mechanic happened to show up throughout the block, but only fourteen cards were made with it. (Two more proliferate cards would later get created—one as a commander in Commander (2016 Edition) and another in Unstable.) The mechanic was an instant hit with the players, so it's no surprise that they expressed interested in seeing it return. As you will see, this proved to be a bit harder than expected. There was a tiny window during Return to Ravnica block where we talked about allowing returning mechanics as guild mechanics. Our go-to example was that proliferate would make a great Simic mechanic. We chose not to allow returning mechanics though, so proliferate never truly had a shot at returning. Kaladesh was a set where one mechanic (energy) gave counters to players and another mechanic (fabricate) put +1/+1 counters on creatures. It was kind of anti–Scars of Mirrodin in that the counters were more positive for you rather than negative for your opponent. That meant proliferate would play very differently in the set than it had in Scars of Mirrodin block. Proliferate was added relatively early on in the set's design as it seemed the perfect place for its return. So, what happened to it? It ended up being more synergistic with +1/+1 counters than energy counters because the differential between +1/+1 and +2/+2 was so much greater than between one energy and two energy. The problem was that we couldn't scale back on +1/+1 counters as it was one of the major themes of the set (being used as a means to represent creatures using technology) showing up in one of the mechanics. After much discussion with the experts on play balance (this was prior to Play Design existing), it was cut from the set. It was so synergistic that the issue came up the very next set. It just fit the block so well. Maybe if it showed up in a smaller percentage for Draft, it could work. (Aether Revolt would supply only two of the three packs in its Draft format.) Also, fabricate wasn't in Aether Revolt, so that meant the set could lower the overall as-fan of +1/+1 counters. The Design team experimented with a whole host of solutions to try making proliferate work, but none of them did. All the reasons why it was a poor fit with Kaladesh were basically true with Aether Revolt. After exhausting every avenue, the Design team removed it from the set. We were back in Ravnica, and this time we were willing to bring back old mechanics as guild mechanics. In the very first meeting, we talked about what we could bring back for each guild, and proliferate was listed for the Simic. By our first playtest, proliferate was the Simic mechanic. We worked hard to balance proliferate with the other mechanics such that it was something you might want to splash in other guild decks on monocolored cards. (For example, much of the proliferate was on enters-the-battlefield triggers which played nicely with precedence, the Azorius mechanic at the time.) This time, proliferate made it all the way through vision design and got handed off to Set Design. Again, proliferate suffered for being a little too efficient. Simic has a +1/+1 counter theme (and its guild mechanic adapt uses +1/+1 counters), and the synergy with proliferate was strong—unfortunately, too strong. The counter theme is a huge part of Simic's identity, so it wasn't something Set Design could just cut out. Also, the Set Design team changed many of the guild mechanics, and the synergies with the other guilds weren't quite as balanced as they had been in vision design. Set Design tried to make it work, but in the end, it was just causing too many problems and had to be removed. Early in his career, actor Jon Cryer had been cast in numerous television shows that got cancelled shortly after starting. This happened enough that he got labeled the "Show Killer." That label made other showrunners (aka people who run television shows) hesitant to hire him. I was worried the same would be true for proliferate. After so many attempts to make it work, I was worried that it would be written off as a mechanic that should never see the light of day again. While all this was going on, I was interacting with the player base day to day, and the topic of proliferate returning always came up. It's just a fun mechanic that many of the players wanted to see return. Every time a set came out that would be synergistic with proliferate, they would ask me about why that set didn't have proliferate. Some of the time, I had to reveal that it did at one point, but it got cut. "Have faith," I'd say, "we haven't given up on the mechanic. We'll keep trying," but with each failure I worried that the chance of its returning was shrinking. Flash forward to the middle of War of the Spark vision design. 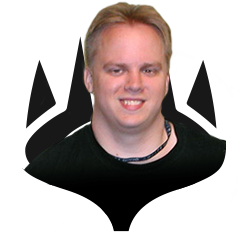 We'd recently committed to the Planeswalker theme and had been designing uncommon planeswalkers. One of the things we knew we wanted was a way to add loyalty counters because the uncommon planeswalkers didn't have plus-loyalty abilities. As we talked though the options, there was clearly an elephant in the room. "Should we consider proliferate?" Everyone wanted to include proliferate, but we were nervous that the same reasons that killed it before would kill it again, so I went and talked with the Play Design team. Was there a common theme to what had caused all the previous sets to kill proliferate? Yes, in each case +1/+1 counters had played too strong a role in the set, making it hard to balance the effect. What if we had a set where +1/+1 counters played a smaller role? Could it work then? Maybe. I then asked if having a lot of planeswalkers was a problem, but they said no, the differential between plus one loyalty was nowhere as strong as the differential between +1/+1 and +2/+2. Also, planeswalkers had a knob. 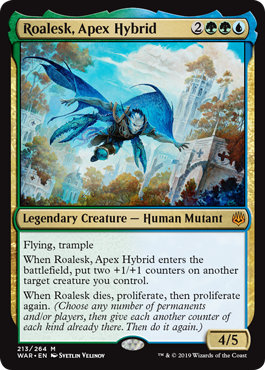 A 2-loyalty planeswalker that had an ability that cost 1 loyalty and a 4-loyalty planeswalker that had the same ability that cost 2 loyalty are basically the same card in a vacuum, but they interact with proliferate differently. This could allow them to balance cards against the proliferate mechanic, especially in Limited. What this meant was that we'd have to be careful with how we used +1/+1 counters. It wasn't that we couldn't have them, but we'd have to do so with the knowledge that proliferate was in the set. Unlike Kaladesh block and Ravnica Allegiance, +1/+1 counters weren't the backbone of another strategy and weren't part of a keyword in the set. (Amass wasn't in the set yet; I'll talk more about its creation next week.) The cards that used them were designed individually, allowing us a lot of flexibility in adjusting their power levels. The next thing we needed to do was adapt proliferate for War of the Spark. Part of bringing back a mechanic is trying to find an environment where it plays a little differently than the last time it was around. The biggest difference with proliferate was that Scars of Mirrodin block primarily used proliferate to hurt the opponent, and in War of the Spark, it would primarily be used to help yourself, adding loyalty to your planeswalkers and +1/+1 counters to creatures. This would impact two things—first, the colors that mechanic appears in and then, in turn, the kind of effects we could use with it. In Scars of Mirrodin, proliferate was primarily used in blue and artifact, most often on one-shot effects. It showed up on two black cards, one red card, and one green card with the green card having the only repeatable effect of the three colors. In bringing it back, it was clear that we wanted to put it into blue and green as those are the two colors that it most naturally fits in both flavorfully and mechanically (and the reason Simic was such a good fit). For the third color, we chose white because it plays into the constructive nature of the mechanic this time around, and white was the friendliest color in helping planeswalkers. As for the execution, there were three other big changes. One, we were more willing to put it at lower rarities and on more cards. War of the Spark, for instance, has proliferate appearing on fourteen cards, more than appeared in all of Scars of Mirrodin block. Two, we were more willing to have it appear on effects that don't also create a counter. This is because the Limited environment will have enough planeswalkers and +1/+1 counters that proliferate should be impactful most of the time. Three, we're also more willing to have repeatable proliferate effects. We were extra careful about it last time because of developmental concerns, but we now have our Play Design team, and they were willing to be more aggressive with the mechanic. And that's how the fourth try to bring proliferate back became the one that worked. Now that you've heard about what we had to do to get proliferate back into Standard, why don't I show you one of the new toys that's going to be using it? As you can see with the double-proliferating death trigger, we're playing around with some different things we can do with proliferate. I hope all the proliferate fans out there will be happy with what we've done with the mechanic in the set. That's all the time I have for today. I hope you enjoyed the tale of proliferate's return to the game. As always, I'm eager to hear any feedback you have on today's column or War of the Spark. You can email me or contact me through any of my social media accounts (Twitter, Tumblr, Google+, and Instagram). Join me next week as I talk about a wild side trip the design took as well as the story behind the amass mechanic. Until then, may you proliferate with a battlefield full of counters.